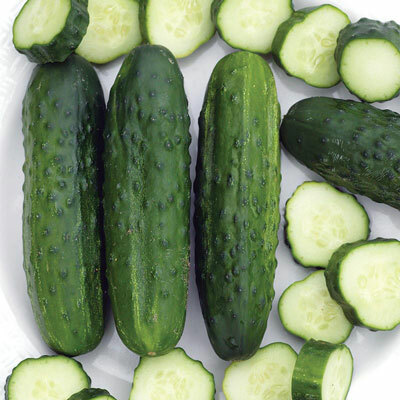 Sassy Hybrid Cucumbers | Henry Field's Seed & Nursery Co.
Superior for Pickling and Canning! Green, crisp and plump fruits. Harvest forslicing when 6-10 in. Or pick early at 3-5in. for delicious dill pickles! 57 DAYS. Depth: Plant seeds 1 inch deep, 4 - 5 to a hill, with hills spaced 6 feet apart. Spread: 9 - 12 inches. Color: Has a dark green fruit color and yellow-orange blooms. Blooms: 57 days to maturity. Seed Count: Approximately 35 seeds per packet. Size: Produces highly concentrated yields of slightly tapered fruit.